The Close Encounters department at the Minnesota Zoo facilitates a variety of programs with animal ambassadors throughout the Zoo. Additionally, we collaborate with other departments to develop and progress training initiatives with animals in their areas. The Close EncounterÍs collection recently moved to a new space with visual access to natural light and weather patterns which has created wonderful natural enrichment for the animals. However, we have found ourselves battling Mother Nature as the exposure to natural elements has effected the motivation of our animals due to their natural response to seasonal changes. To maintain behavior and progress our animalÍs training, we have implemented the use a variety of techniques. These approaches include more variable timing of feeds, variable length of sessions, diet adjustments, encouraging other biological needs as motivators, finding new types of reinforcement and daily changes in environment to influence and increase motivation. These techniques as well as a lot of trainer patience and flexibility, have helped to keep our animals on track. Conversely, other species we work with (such as our moose) thrive in the cold so their motivation spikes in the winter allowing staff to capitalize on their high motivation. This paper will discuss in detail what has worked and what hasn't worked to finesse techniques to combat weather and seasonal changes to keep animals motivated throughout the year. In 2008, the polar bear (Ursus maritimus) was classified as a threatened species under the U.S. Endangered Species Act. Given the impending climate change crisis facing wild bears, zoos are striving to not just manage their collection, but also to use cooperative voluntary training, or conservation training, to help better understand the impact of a warming Arctic on their wild counterparts. After a successful voluntary blood draw from 1.1 polar bears at the Oregon Zoo in 2012, a researcher from the United States Geological Survey (USGS) asked us to participate in a nutritional ecology project. This development of a new technique for studying wild bears required adjusting the bearsÍ diets and obtaining frequent voluntary blood and hair samples to determine how certain isotopes in a bearÍs diet are incorporated into their tissues. This successful collaboration led to an additional project with the USGS Alaska Science Center. That relationship developed into an ongoing energetics research collaboration with the University of California, Santa Cruz (UCSC) and USGS. Thus far, this research has included training a 0.1 polar bear to wear a satellite collar, walk on a treadmill, and swim inside a metabolic chamber. We are excited about improving animal welfare through cognitive challenges and at the same time gaining a better understanding of the effects of declining Arctic sea ice on bear behavior. Looking forward, the Oregon Zoo will continue to support conservation research as the organization develops and builds a new polar bear habit for the next generation of polar bears. The relationship between a trainer and an animal ambassador is one of the most important factors of a successful ambassador program. This relationship allows a lot of the operant conditioning we rely on to take place. Because of this, animal ambassadors have traditionally been hand raised by their human care takers. While zoological institutions have dedicated much research and expertise to developing and refining formula composition and hand rearing techniques, animal care professionals have begun to question if welfare could be improved by allowing the ambassadors to be raised by their mother. 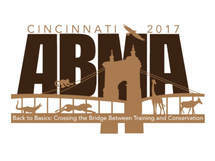 In recent years ambassador programs have been a focal topic of many professional zoological organizations including the AZA. Specifically the Ambassador Animal Scientific Advisory Group seeks to improve welfare within the ambassador community and explore ways education and research can contribute to animal handling and management standards. One of the ways San Diego Zoo has addressed this movement and proven their dedication to advancing the highest level of care is through the co-rearing of ambassador animals alongside their mothers. Linnaeus two-toed sloth, African serval, and Rock hyrax are all species that have been raised while living with their mothers and receiving daily visits from animal care staff. This process has shown that positive relationships, powerful educational messages and successful animal programs can result while neonates receive the balanced nutrition of their motherÍs milk and the socialization of conspecifics. The results have been confident animal ambassadors willing to work with a large and diverse group of trainers and handlers. clothes to sleeping on branches. They stopped eating homemade food and began eating vegetation. under human care is to increase high standards of well-being through proactive programs. This study investigated the effect of an enrichment device (a metal tray containing bark chips) on the behavior, territories, and social organization of a group of 47 African grey parrots (Psittacus erithacus) in a naturalistic aviary. This study's aims were to: (1) Describe behaviors performed by the parrots at ground-level; (2) Ascertain whether parrots have ground-level territories; (3) Analyse the effect of provision of an enrichment device on individual parrots and on the group; and (4) Assess whether enrichment provision causes disruption to social structure and parrot territories. Baseline observations of parrot locations were used to map territories. The enrichment devise was then placed on the ground in different territories and behaviours and locations of parrots were recorded. It was found that: (1) Nearly half of the parrots performed digging, locomotory, mulch-chewing, foraging, and social behaviors at ground-level; (2) one individual performed more inactive behavior (sleeping, standing, autogrooming) during baseline than when enrichment was present, P=0.046, two-tailed randomization test; (3) The enrichment device appeared to increase foraging behavior of three individuals but not of the group; and (4) the social network and territories were generally stable over time, but enrichment provision had a local effect on the size of two territories. Social dynamics and territoriality limit the welfare benefits of a single enrichment item, so providing enrichment items within each territory is recommended to prevent social distress and increase resource access. There are always going to be challenges and obstacles when training animals. ItÍs important to keep in mind there are numerous ways to train a behavior. Often times when we are faced with difficulties, we find ourselves cutting back on training or putting the behavior on the back burner only to never go back to it. However, persistence in training can lead to a more successful outcome. A blue-tongued skink at the National Aquarium provided such a challenge when learning a tongue- to -target behavior. In order to achieve the desired behavior, the trainer broke down each obstacle and restructured the training plan. With determination, consistency, and practice the skink learned to touch his tongue to a target. This behavior was then incorporated into animal presentations to engage and connect our guests. The National Aquarium has developed presentations specifically for teaching guests that all animals have cognition and can learn. In turn, we hope this inspires our guests to better care for animals, formulate positive relationships with them, and initiate conservation efforts. These trained behaviors are important for not only cognitive stimulation but may be useful to help bridge the gap between training and conservation. With the recent recommendation for uplisting of the African cheetah to ñendangeredî, it is clear that educating zoo guests about cheetahs is crucial to increasing awareness and encouraging conservation-based actions (Durant et al., 2016). Pairing cheetahs with domestic dogs can be seen at multiple zoos across the country. The Columbus Zoo and Aquarium uses the cheetah and dog friendship to give the cheetahs confidence while connecting people with wildlife as an Animal Programs ambassador. We saw the potential for our dogs to be more than a companion animal to our cheetahs; the dogs convey a message for cheetah conservation with the way groups, like the Cheetah Conservation Fund, are utilizing dogs to save cheetahs in Africa. In our Heart of Africa region our dogs show off their speed chasing the lure, just like their cheetahs, in our rotational Watering Hole exhibit. After winning the crowd over, the dogs are trained to bring the lure to the presenter and follow them to the public pathway where they station in front of the cheetah habitat to interact with guests. There, volunteers are waiting with cheetah bracelets and pins in exchange for donations to conservation. Allowing the dogs to connect with guests increased donations compared to previous years. With guests in Heart of Africa more frequently asking "when will the dogs be out?" we are confident we are forging a deeper connection and understanding between zoo visitors and cheetah conservation.